A state transportation official says the owner of the limousine that crashed and killed 20 people in upstate New York was warned not to operate the vehicle after it failed an inspection. Department of Transportation spokesman Joseph Morrissey says Tuesday that the 2001 Ford Excursion that crashed Saturday was placed out of service after a September inspection and was subject to additional inspections. The limousine ran a stop sign and crashed on a rural road 25 miles (40 kilometers) west of Albany on Saturday, killing the driver, all 17 passengers and two pedestrians. State police and the National Transportation Safety Board are investigating what caused the crash. Two days before a limousine crashed and killed 20 people in upstate New York, the limo company posted a vehicle for sale on Craigslist matching the description of the one in the fatal accident. The listing for the modified 2001 Ford Excursion asked $9,000 and described the vehicle as being in “excellent” condition, “DOT Ready full serviced,” with 180,000 miles on the odometer. The listing, first reported by the Albany Times Union , had the same contact number as that of several companies owned by Shahed Hussain, owner of Gansevoort, New York-based Prestige Limousine. The limousine that ran a stop sign and crashed on a rural road 25 miles west of Albany Saturday was cited for code violations Sept. 4. The company’s lawyer says the issues had been corrected. The family of Scott Lisinicchia (lis-ih-NIK’-ee-uh) released a statement through their lawyer Tuesday asking the public to not jump to conclusions about the cause of the crash that killed 20 people Saturday. Investigators are trying to find out why the limousine ran through a stop sign at the bottom of a T-intersection on a rural road 25 miles west of Albany. New York State Police have officially released the identities and hometowns of the 20 people who were killed when a limousine crashed off a rural upstate road last weekend. Troopers released the information Tuesday afternoon, three days after the limo carrying 18 people crashed at an intersection in Schoharie (skoh-HAYR’-ee), 25 miles (40 kilometers) west of Albany. The limo driver, all 17 passengers and two men standing in a store parking lot were killed. The cause of the crash is being investigated by state police and federal transportation officials. The identities of the victims have been previously reported in news articles. Authorities had said they would release a full list of names once all relatives were notified. Flags on New York state property will be lowered to half-staff to honor the 20 people killed in a limousine crash, among them three state employees. Gov. Andrew Cuomo announced Tuesday the flags would be lowered from Thursday through the victims’ burials. Cuomo said “the entire family of New York mourns” for them. The victims were killed when a stretch limousine hit a parked SUV Saturday in Schoharie (skoh-HAY’-ree). It’s about 40 miles (64 kilometers) from the state capital in Albany. One victim, Patrick Cushing, worked in the state Senate’s technology office. Another, Amy Steenburg, was a nurse who worked for the state Justice Center for the Protection of People with Special Needs. A third, Brian Hough, taught geology at the State University of New York at Oswego. An attorney for the company whose limousine was involved in an upstate New York crash that killed 20 people says multiple safety violations on its vehicles were fixed before the tragedy. Attorney Lee Kindlon tells CBS News on Tuesday he doesn’t think the recent infractions against Prestige limousine service contributed to Saturday’s deadly crash. The limo ran a stop sign and hit a parked SUV in Schoharie (skoh-HAYR’-ee). Two pedestrians and all 18 people in the limo died. Kindlon tells the Times Union of Albany the driver may have been unfamiliar with the roadway and misjudged his ability to stop at the bottom of the hill. The owner of the company is out of the country. His son, Nauman Hussain, met with state police investigators Monday. A ceremony for the victims of the limousine crash that killed 20 people has ended with participants lifting candles above their heads to signal unity and perseverance. 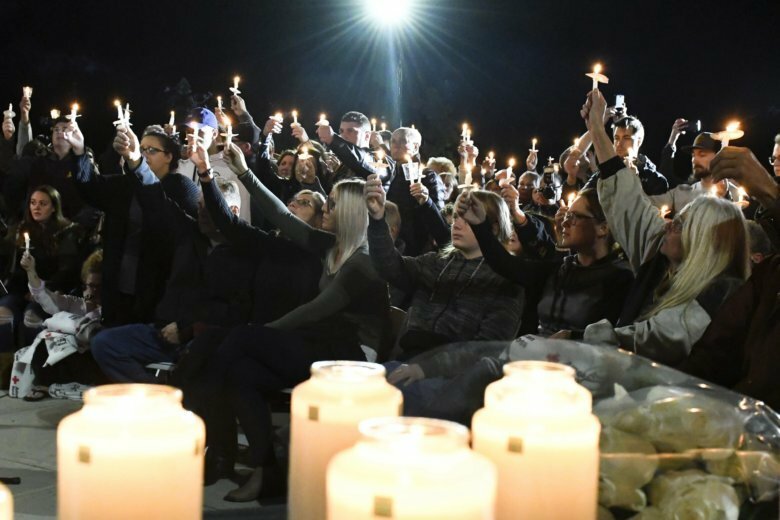 Over 1,000 people jammed a riverside park in Amsterdam, New York, for Monday night’s vigil. Some victims lived in the small city. U.S. Rep. Paul Tonko told the families, in his words, “We are crushed with you, we are crushed for you.” He’s a Democrat from Amsterdam. The 19-seater limo ran a stop sign and hit a parked SUV on Saturday in Schoharie (skoh-HAYR’-ee). Two pedestrians and all 18 people in the limo died. The passengers were headed to a 30th birthday party.